Epic 7: Your JRPG Mobile Hot Spot: Guilty Gear Collab Coming 4/25. I'm gonna cross post this just in case some G&T people would be interested in playing, but don't frequently SE++. 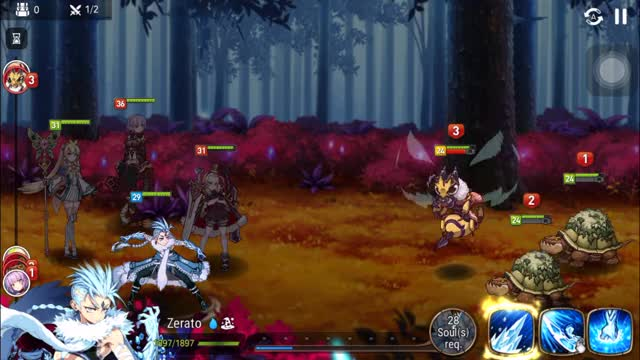 Epic 7 is a pretty 2d JRPG/Gacha game from Smilegate. You play as Ras, the heir of the covenant, a being created by the goddess to help safeguard the planet Orbis from the Arch Demon. Each time the Arch Demon appears, Ras awakens to help save the day, but the last time the Arch Demon appeared, he did not awake, so the country of Ezra had to pull itself together and fought a long war, which they won, to seal him away. This, however, left a lot of people both disillusioned with the Heir, and caused people to question the goddess. Our story begins with Ras awakening to find out the Arch Demon was defeated 20 years ago. Epic 7's pretty good about free to play. It has a built in reroll mechanism (you get to choose the best of 30 10 pulls early on so you can get a good starting set of characters/artifacts), and this is definitely a game where it's not 5 star super rare units or bust. Some of the best units are 3 or 4 stars (the best healers are 4 stars, and best tank is a 3 star). So what content is there? Well, we got Adventure mode, where you learn the story of the world (not a bad story, and the world building is pretty interesting). This is the best exp/energy mode. We have Hunt, where you select to go after a Wyvern, Golem, Banshee, or Azimanaks (big bugs). Each enemy has its own gimmick that requires you to build your team composition around it. This is where a lot of high level gear comes from. We have Labyrinths/Raid, which are dungeon crawls. Best place for accessories, and the hardest content is here (and in the abyss). We have the Abyss, which is a tower of battles. Some real good gear comes from here. Lots of gimmick fights, and lots of high health bosses. We also have the Arena for PvP fighting, and Guild wars for that too. We got a lot of stuff is what I'm saying. Once you're building teams at Level50/60, the speed stat's real important. You want to aim for critical hit rates over 50% for most DPS units. Team composition is important. Try to have someone to take hits, someone to heal, someone to deal damage, and someone to do defense down. Obviously other buffs/debuffs are really useful, but you want to be able to do those 4 with any composition for real success. Make sure to join a guild for the extra bonuses. General rule: Weapon/hat/body always are attack/health/defense as main stats. The secondary stats are always random and the sub stats get enhanced at +3/6/9/12/15. For necklace/ring/boots: Do not use (after like level 30, a.k.a. beginner times) flat main stats for health/defense/attack. The %health/defense/attack are much stronger. Necklaces are health/defense/attack/crit chance/crit damage. Also note: Effectiveness increases the chance of status ailments working and effect resistances resists them. However, the base chance of a debuff to land cannot be changed with effectiveness. i.e. if a ability says 50% chance to stun, it has a 50% shot. Effect resistance reduces it below 50% and effectiveness works to counteract that. So come on by, and try your luck! Oh hey, it’s the best one. If I were to sell anyone on this game it’s Super Robot Wars, but anime. They have done an inordinate amount of work on their 2D sprites, the game is GORGEOUS. I've had some pretty great luck with pulls in this game. Started out with Iseria and Lots on my 30 pull. Since then I've also pulled Tenebria, Ravi, and Charles (twice!) along with Cidd and Karin. I have no idea how to build a order team but I'm having fun so far. oh I guess I should put a friend list in the OP. I'll try to add to it. Ravi in the front position, Charles in second position with Aurius artifact, Lots, and Karin can be a team that works fine for a while. Fair enough. So try to build a lifesteal set for Ravi then? Also why Karin? She's been kinda underwhelming while Iseria and Tenebria rip through everything. Ravi has built in healing on S1. Power it up a few times. It does work. Karin needs to be built for 100% crit rate (recall you get plus 15% crit against elements your strong to). Then her S2 gives defense down amd another turn. She’ll enable big damage. Iseria is good too just doesn’t synergize with Ravi. I’m a bit biased towards Ravi becauae I’ve great success with her. As a reminder: you should make sure to farm the current sidestory to buy out the blazing soul catalysts ( and the others too) Catalysts are a pain to farm so this is an easy way. I got Karin to almost 70% crit last night and yeah, I'm seeing why people like her now. I miss Tenebria's AoE attacks though. I never really played gacha games before this one because of their obvious drawbacks. Ladyjubs got me into it. Ive not spent a cent on the game and have had a ton of fun with it. Always something to do heh. If you want to add me my name should be forum name and if im full just yell at me and ill free up space. I still play it consistently. I got Cermia on the 3 or so pull and she is looking to do some good dmg. Yea, you can see her value as you get closer and closer to 100%. Well if you're just gonna use her on fire enemies, you only need 85%. We got some big patch notes coming on Wednesday, per a prior announcement on the site, so you should take a look if you haven't. With the Kluri nerfs incomming im glad ive spent my time having armin up and now phylis because they are really strong too. Seems kinda weird for a gacha game to nerf the things people pay for. How much of an uproar is there over this? They didn't nerf her into the ground just made her less uber strong. They got rid of her extra attack chance passive, changing it to combat readiness buff chance and her buff removal ability was given an extra turn of cooldown. well, whenever they nerf a unit in this game you're allowed to recall all the stuff you invested into them (molagoras/remove gear for free/runes back for specialty/awakenings). Kluri's a 3 star tank who at level 50 can specialize into Falconer Kluri, who is considered one of THE best tanks in the game (top 3 in PvE and PvP basically). They're adding one turn cool down to her S3 and changing her from having a chance of a bonus turn of 15% to a 10% chance of being placed halfway to her next turn. The former's a light tap, while the latter is pretty big. She's still gonna be good. I did the 30 test summons, I think I stopped at 25 where I ended up with Ken (and a few 4* artifacts), and the tier list seemed to consider him really strong. My issue though is it looks like you really need a specific gear set or artifact for those units to make the most of them, and a lot of those are 4-5* items that are part of the unit gacha. I didn't do a lot of deep info diving into the game, but is there a way to get those preferred artifacts from anything other than the gacha? I actually also had a pull with Iseria as well, but everything else was 3* and looked like trash, so I don't know if I'm fucked for being in a good spot to keep going with the account or what. Artifacts and Heroes come from the same pool. If you're not gonna start with Ravi, you'll wanna start with a healer and just use Ras to tank till you get something better. Ken's fine. Iseria is good, but she's a support really and needs someone else to work with. She's someone you'll be happy to have once you have someone who she enables. Don't write off 3 star units in this game. Many are considered quite good at their jobs, even if something out there does it a bit better. I need to know more about what you have to really give you more info. I have Cermia, Ravi, Lots, Achates, Surin, and Mercedes for 4+* units. I've been running Cermia Ravi Lots and Surin. Any 3* units I should look at to fill out team "single target damage only?" Also, all of these 2* automax beasties: should I merge them with themselves to 3*, or is there another use? Pretty sure I didn't see Ravi pop up in any of the summons, and who knows if they would've come up in the last 5. If I had known that Ravi was one of the top DPS to start with, I would've probably kept trying to reroll, and of course I was trying to go for a better healer than freaking Aithir, but I was getting desperate as the final summons came up and Ken seemed to be the best of the final pulls and I didn't want to risk a full 10 pull of nothing but 3* artifacts or something terrible. @El Fantastico There's an artifact shop that rotates four new 5* artifacts each month. You sell other artifacts you get to buy stuff in that shop. You might have to wait a while for something to rotate into stock but you're basically guaranteed to get what you want eventually. I started playing in mid January and I just bought the best artifact in the game (Rod of Armordillo). I'm about 60% of the way to buying something else while sitting on probably well over a third of the bookmarks I've gotten so far. If I spent all those to summon stuff I would definitely have enough dust to get something right now if I wanted. It's pretty generous. And for general purposes 3* and 4* artifacts in this game are very good. Ken will get by perfectly fine with Hell Cutter or uhh... Daydream Joker in 90% of situations. For gear sets you're going to use free stuff from story/labyrinth/abyss for a looooong time you don't need to worry about what's optimal. @milski They are little redundant because Cermia doesn't need attack boost and can probably get away with no defense break but I'd still say Kluri and Hazel are the best. Hazel boosting Ravi's attack would mean a lot of damage combined with Cermia. Kluri defense breaks and heals and CCs and makes your nerds move fast. General practice is to use the random level 1 2* plants/mice/robots to promote your white dogs. Then you level the dogs to 30 and use three of those random 2*s you've leveled and promoted to promote the dog again. Rerolled anyway, but the account with Ken is saved. I just don't know how far I'll get with that account with Aither as the healer unit. In what is perhaps the best pull I just did on the new account, 6/10 pulls were 4*. I have nooo idea if those artifacts are good. Sadly, Karin was the only character pulled. If I had gotten a Kluri, I wouldn't hesitate to keep this roll. As it stands now though, firmly "not sure?" I personally wouldn't ever settle for no 5* since it's the only chance of "picking" one, even though a roll with, say, Achates/Cidd would coast for most of the game. For a barebones start I think a nice healer is more convenient than a damage dealer. You can use friend units to get carried through the whole story then pick up Lorina for free and she's a top tier DPS. 3* healer pool has units that work but they don't have anywhere near the versatility of Achates/ Angelica/Destina. Kluri is very good but 3* pulls shouldn't impact the decision too much. You have to be real unlucky to not get her in a reasonable timeframe. But it's all close enough together that my first suggestion would be to just take a 5* hero you think is cool. Unless it's like Basar or Baal & Sezhen. On the other hand I find rerolling pretty fun so I personally don't mind shooting for something above average either. I haven't been lucky enough to see any rolls with Angelica, Destina, Diene, Ravi or Tamarinne. The most common 5* I keep rolling up is Ken (4 times in one full 30 pull). Funny enough, I did have one pull where I had both Achates and Cidd, with matching 4* artifacts for their archetypes, and I was really considering keeping it because it was like, pull 7/30, but I chanced it and rolled onward. I'm a min-maxer at heart, so I don't mind continuing to push my luck until I get a decent roll to keep, and it sounds like 5* Healer > 5* DPS > certain 4* characters > reroll is how I should be aiming to setup. I did all 30 and only got one 5* and the tier list said it was the worst one. Sounds like my gacha luck as of late. Doubt I’ll care enough to ever play the hour and a half to get to the selective summon thing again. Neat looking game though, I wish it was about 95% less thirsty. I had one decent roll with like 2 4* characters but they looked so ridiculous I had no interest in keeping them. I'm still new but as I understand it Destina is actually the least desirable of the three healers. Getting Achates or Angelica along with a decent 5* is the dream. I ended up with Iseria and Lots after a bunch of rolling and have been pretty happy with the team I've been rolling with, but again, I've been really lucky with my rolls since then. Got a roll with a Ravi and some 4* artifacts. It was 27/30 so I wasn't going to chance rolling more for a healer. Guess I'll stick with this account for now and see how far I can go. Ravi self heals so you’re good. Aither is a fine healer to start. Destina is super good. Like she’s a bit slower than angie but super tanky. Don’t get too hung up on pulls. Yeah I would say Aither is perfectly fine to heal. His barrier scales twice so it can get pretty hefty. The pulls will come. This game hands out gems. Just resist throwing your 3 stars at promoting other heroes in order to keep varieties needed to get all stars from story missions. Feed your dupe 3 stars to the same unit for memory imprints which are free stats to the rest of the party. You get bookmarks for the achievements related to that too. Also, do pvp. You get skystone each time you promote for the first time and get free stones per week based on ending rank tier. My free summon today gave me Tamarinne. Looking over her skills she seems amazing. Is Lots benched? Yeah after they lowered her transform cd she became pretty nuts. I got smoked by a lower level, but geared, 3 soul weaver group that had Tamarinne, Destina and Angelica in PVP. Id say keep leveling up lots though. If you get into guild wars you might need another soul weaver geared up and he is ok there. Lots has been great and I've enjoyed his turn manipulation shenanigans but Tamarinne just looks bonkers. Yeah she can do some respectful damage as well. Plus her transform animation is one of my favorites. Tama is considered one of THE best healers by a mile. She's super super super super good. I finally got around to investing some golas into Destina as she was strong enough without them but I had some to use. Having -1 on her S3 is pretty damn nuts. Yea. A lot of heroes became so much better when you knock their CDs down.